Hasn't every age claimed somehow to have mastered God? The Ancients bound Him to ritual; the Enlightenment exalted reason over Him. Contemporary science subverts Him through alternate explanations, claiming there are no mysteries-and therefore, nothing is beyond reach of our minds. That 'Science has ruled out divine action in the world' is an axiom we have, in practice, come to fully accept. A god (one idea among many) isn't compatible with the cosmos as we know it. 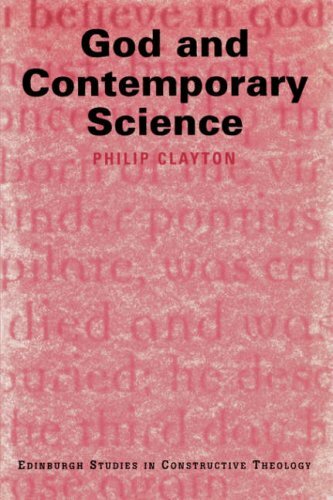 Clayton's book (a contribution to a series called Edinburgh Studies in Constructive Theology, co-edited by Clayton and Kevin Vanhoozen) is a theological response to the challenge modern science has directly and indirectly posed to Christian Faith. He considers developments in philosophy and natural science, summarizes key issues in the science and religion debate, and addresses consciousness, agency, and the theory of knowledge. Trinitarian and Christological dogma find their place at the very center of Clayton's approach, as well as a theology of history and divine action. Clayton's interpretive key here is panentheism, 'a widely discussed though controversial approach to the doctrine of God.which locates the world within the divine being while still insisting that God transcends the world.' These are critical issues for the Christian in post-modernity; the question we must now consider for the sake of our culture is not 'has God acted?' but is rather, 'how has God acted?' Philip Clayton is convinced that we can give our age a relevant answer. It is widely believed that contemporary science has ruled out divine action in the world. Arguing that theology can and must respond to this challenge, Philip Clayton surveys the available biblical and philosophical resources. Recent work in cosmology, quantum physics, and the brain sciences offers exciting new openings for a theology of divine action. If Christian theism is to make use of these opportunities, says Clayton, it must place a greater stress on divine immanence. In response to this challenge, Clayton defends the doctrine of panentheism, the view that the world is in some sense "within" God although God also transcends the world. God and Contemporary Science offers the first book-length defense of panentheism as a viable option within traditional Christian theology. Clayton first defends a "postfoundationalist" model of theology that is concerned more with the coherence of Christian belief than with rational obligation or proof. He makes the case that the Old and New Testament theologies do not stand opposed to panentheism but actually support it at a number of points. He then outlines the philosophical strengths of a panentheistic view of God's relation to the world and God's activity in the world. The remainder of the book applies this theological position to recent scientific developments: theories of the origin of the universe; quantum mechanics, or the physics of the very small; the debate about miracles; and neuroscientific theories of human thought.